When you are loading items into your sedan or SUV, you will want to make sure that all loose items are secure before you put them into the vehicle. If it is possible to strap down small boxes, you should do that. This will keep them from flying around while you are driving. It is also a good idea to put the heavier boxes on the floor of the cargo area. 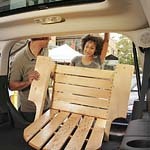 As you load cargo into the back of your vehicle, you will want to pay attention to where you are placing each item. You should make sure that you leave the rear window and space in front of it clear. This will allow you the visibility you need to stay safe while driving.